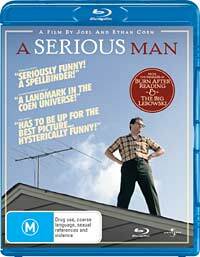 A Serious Man is a dark comedy of stress, in which you see a youngish Jewish-American professor's life fall apart. Set in the late 1960s, the whole story is embedded in a suburban Jewish culture. Indeed, one of the short extras provides a video glossary of some of the Yiddish terminology. The professor is a somewhat Asbergery type, oblivious to problems in his marriage until his wife announces she's going to leave him for another man. This man infuriatingly offers his emotional support to the professor, trespassing grossly on his personal space, while everyone else is oblivious to his pain. I did say 'comedy', didn't I? Dark, dark comedy. As for me, I fell in love with the main character. But about the end, I dare say nothing. Use the disc with caution, though. If your player has BD-Live connected, the disc starts up by downloading a 'preview' for some other Universal movie. It tells you it's doing so, but doesn't ask. According the Oppo BDP-83, these use between bitrates of between 1Mbps and 2Mbps, and the video format is MPEG4 AVC at 720p24. I could see bandwidth usage becoming a problem. If this becomes a common feature, I might have to start leaving BD-Live switched off. You get 'My Scenes', Universal's bookmark and clip marks which can be persistently stored. And a half-hours worth of HD featurettes. But most of all, you get Roger Deakin's cinematography presented so immaculately, it's almost jaw dropping. In fact, on a modern mid-sized LCD TV it can look too good to be true, and have you reaching for your remote to turn down the sharpness control, only to find that it's already down. But on the big projection screen there is just enough suggestion of film grain that it is brought back into the world of reality. This is definitely the stuff to show off a high def video system. The sound in this movie is mostly functional, but there are a few pleasing snippets of Jefferson Airplane that seem positively sparkling.